If you live in the US, you’re undoubtedly familiar with the big box chain, Target. And if you’re like me, you’re more than familiar with it – you’re running into one three times a week to grab cat food, deodorant, birthday candles and the like. But even for those who have never been in a Target, you’re most likely familiar with the Target brand, either from seeing a TV ad, billboard, or weekly circular. These elements of a marketing campaign are essential to any national brand, but there’s another, hugely successful marketing approach that the big brands, like Target, employ. Interactive marketing campaigns such as giveaways and contests, offer even the largest businesses a cost effective approach to collecting quality data that helps them convert more customers. One could even argue that the benefits of a contest or giveaway go way beyond what a TV ad or billboard could ever offer. They’re ridiculously cost effective. 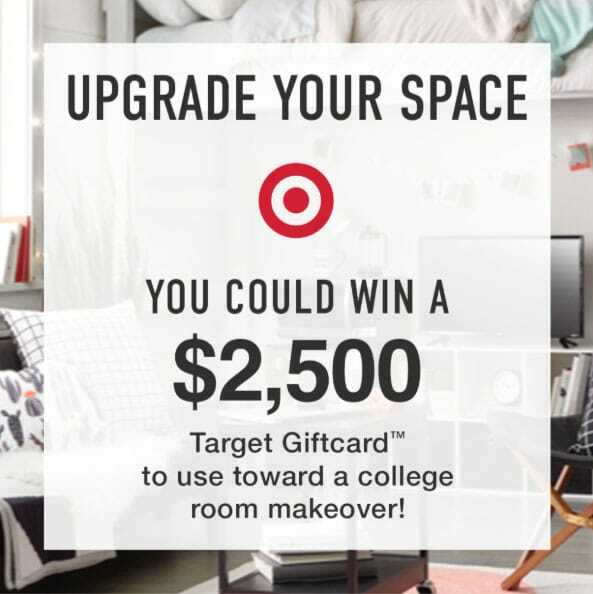 Check out this example of Target’s recent College Room Makeover Sweepstakes. The online campaign received 436,646 unique views (a “view” refers to anytime the campaign was opened). In a mid-size market, to reach 436,646 viewers with a TV ad, the cost would have been somewhere around $10,000. Building an online campaign with a company like ShortStack can cost as little as 0.05% of that. The “interactive” part of an interactive campaign = crazy conversion power. Traditional ads – television, billboards, etc. – offer a very one-sided result. Their message is sent into the ether and people either see it or they don’t. Within an interactive campaign, you can customize an experience for the user to engage with. For example, interactive campaigns can display a video, a gallery of entries, collect votes, display an entry form, and even some “Thanks for participating” text with a discount code when the form is submitted. The best part? At the end of it, you’ll have collected valuable information (an email address, perhaps a birthdate, product preferences, etc.) that you can use for further, highly targeted marketing. In this article, we’ll look at five, hugely successful interactive campaigns to examine what made them successful, and how you can apply those same strategies to your next campaign. But first, we’ll take a quick look at how “success” is defined in an interactive campaign. The definition of a successful campaign can vary from business to business depending on your company’s goal, but there are two universal success indicators that we can look at. The first indicator is the number of views your campaign received. This is literally how many times it was loaded. A unique view is a better indicator than just a general “view” because it refers to how many people viewed the contest, not how many times it was viewed. For example, if an individual visited your campaign ten times, they would count as one unique view. The second indicator is the number of entries your campaign receives. Your campaign’s entries are an important success metric because this is the actionable data that you can use when your campaign is over. The entries will provide you with an email address to add to your mailing list and even further data to help you segment your list and tailor your marketing efforts. Think birthdays, prize selections, or anything that gives you insight into what this potential customer is like, or gives you reasons to reach out later on. Next, let’s look at these five campaign examples that saw major results, and analyze some of the strategies they used. Whether you’re embarking on your first contest or your 50th, there’s a lot to learn from these campaigns that have collectively earned millions of views and nearly half a million entries. Billabong’s newsletter sign-up push received 2,497,452 views and 118,439 entries. Their secret? They offered a juicy incentive to opt-in. 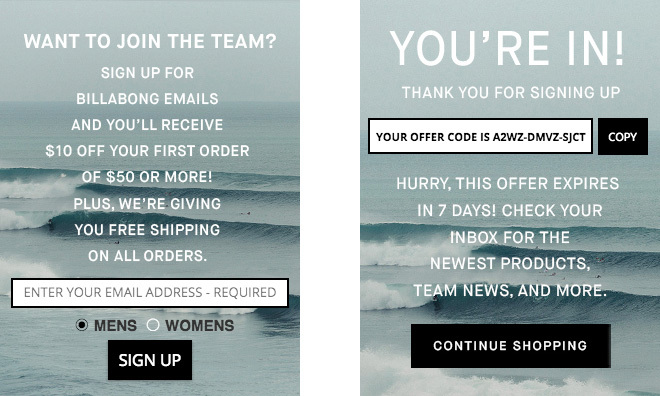 The discount code revealed after sign-up seems like an incentive for the subscriber, but actually translates to big bucks for Billabong. Here’s why: if the discount code is redeemed, the company now has purchase history data for this customer, which translates to better marketing capabilities. Another tactic employed by Billabong is the quick, 7-day expiration period of the discount, which instills a sense of urgency to make a purchase. First, let’s talk numbers. 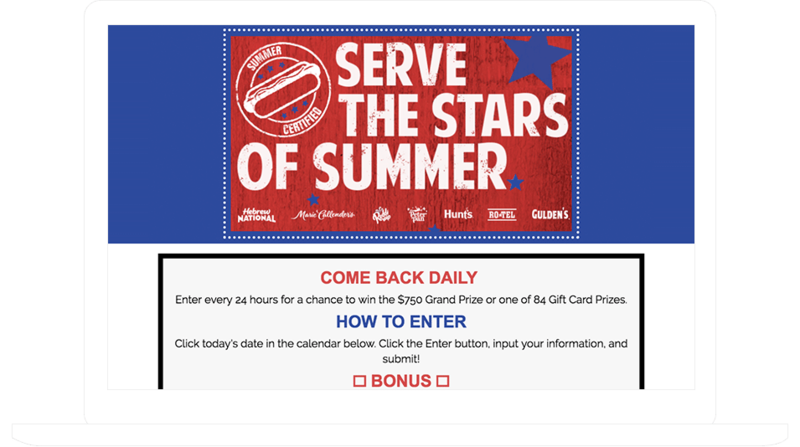 This Serve the Stars of Summer Sweepstakes earned 264,313 entries and 545,077 views! The numbers are partly high because the sweepstakes invited participants to come back and enter, daily. A daily entry strategy is employed by big brands because its repetitive nature has the same effect as seeing that TV ad at every commercial break, or seeing that billboard everyday on your commute to work. Image you spent every day this week entering a giveaway for a year’s worth of oil changes. Even if you didn’t win the giveaway, you’ll undoubtedly think of that business the next time you need an oil change. The repetition of a daily entry will help keep your brand fresh on everyone’s mind. 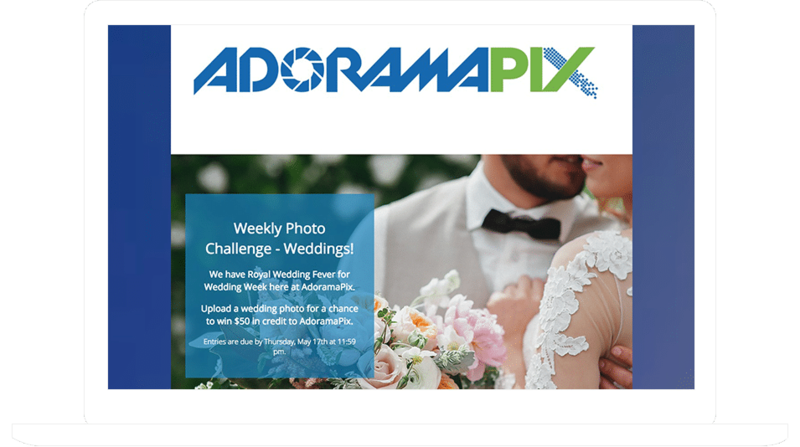 AdoramaPix’s Weekly Photo Challenge ran a wedding-themed photo contest to piggyback on the Royal Wedding hype. Compared to these other campaigns, collecting 85 entries seems like a wasted effort, but where this campaign lacks entries, it makes up for in votes. The magic of a voting campaign lies in its ability to attract fresh new prospects to your brand. And the best part is that you’re not even the one tasked with getting the word out – your contest participants are! When someone submits an entry into a contest, to raise votes, they turn to their friends and family, who may have been (until now) completely new to your brand. That’s why in this contest, those 85 entries resulted in 637,273 views. 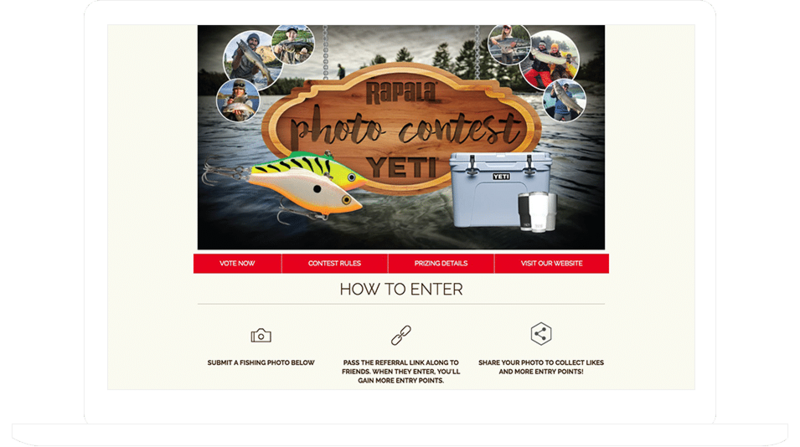 Rapala’s Photo Contest employed a popular approach to get participants to share with their friends. By using a feature that awards users for getting referral entries, the participants were incentivized to share the contest to their social media profiles. If anyone clicked on the shared link and entered the contest, the original sharer would receive extra chances to win. The result? 745,532 views and 5,146 entries! But be careful when offering incentives for sharing. Facebook has strict rules about asking for shares (and even Likes). These rules are different on every platform, so, to cut through the confusion, check out this resource to help you navigate the “what’s legal?” waters of rewarding campaign participants for sharing on social media. If your end goal is to get more subscribers to your email list, bribery can be an effective approach. 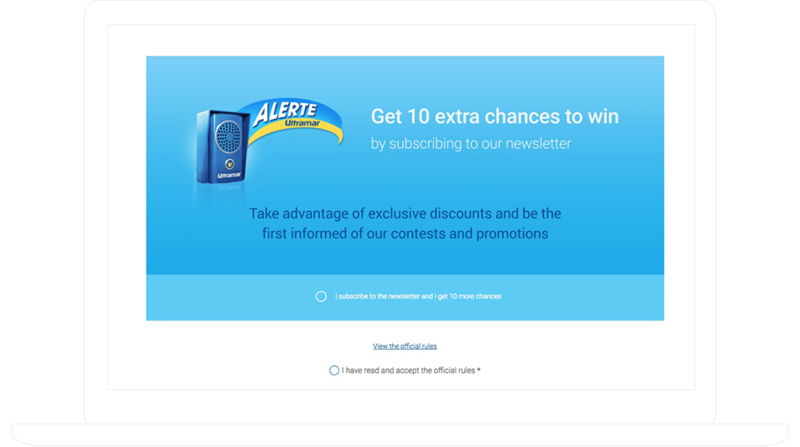 This giveaway hosted by Ultramar offered 10 extra chances to win by simply opting in to receive their newsletter. Enabling extra points or chances to win in exchange for filling in or opting into a form field is a flexible strategy – use it to collect data a user may otherwise be apprehensive about handing over. For example, a phone number, zip code or birthdate. These bits of information can help you understand the age, or geographical location of a participant. Use this information in two ways: 1. To help you understand your audience and those interested in your business, and 2. To help you segment and tailor your future marketing so you deliver the right message to the right person. Try offering a small incentive over multiple questions to help you gather even more data. For example, ask 5 survey questions and offer 2 extra chances to win for each question completed. Although you may not have the ad-buying power of a big shiny national brand, you can still get major results with the right strategy. In a contest, quiz or giveaway, offering a prize, discount, or other incentives is a great way to get your brand noticed and build your base of loyal customers.